Forest Hill Moto3 rider Cameron Horsman ended round six of the Hel Performance standard class championship in fifth place overall having closed the gap on the rider ahead to just seven points. 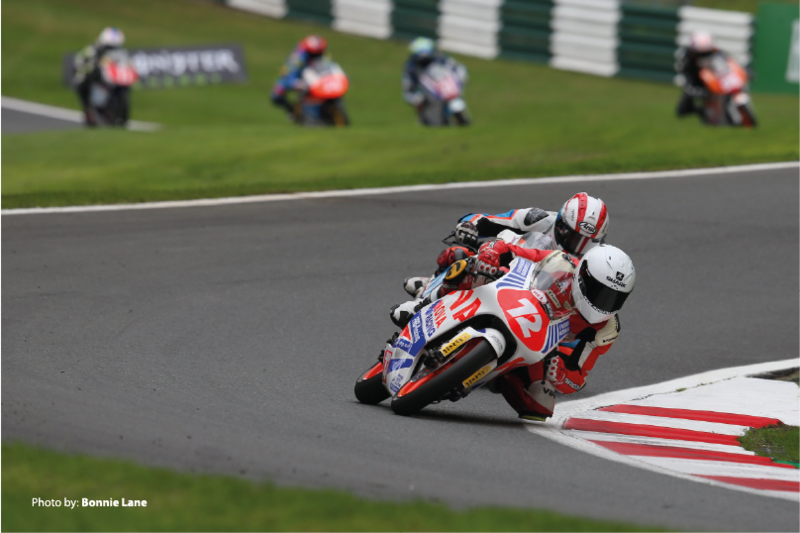 Cameron Horsman used free practice one to familiarise himself with the Cadwell Park circuit once again. In free practice two he then began to increase his pace, finishing third overall with a lap time of 1:37.863. This put him third quickest on the day. After making some small overnight adjustments to the bike set up the Moto3 riders were back out early on Saturday morning for Qualifying. Although Horsman managed to continue to reduce his lap time he finished the session in sixth place. Horsman dropped a couple of places off the start line but quickly recovered to end lap one in sixth position. He was in the leading group of riders. The Moto3 standard class riders treated the spectators to a fantastic show as they constantly changed places, lap after lap. On lap ten of the 12 there was a big accident just after the mountain section of the track which resulted in a red flag. Fortunately, no one was seriously hurt. after the rider, who suffered a mechanical fault and whose bike started the incident was reinstated in his place and on the podium. ground on the lead riders. Digging deep he made up the gap but unfortunately, the race was cut short by four laps after the second red flag incident of the weekend. Cameron Horsman is fifth overall just seven points behind the rider in fourth with three rounds remaining this season. This entry was posted in HEL Motostar Moto3 2018, Latest News. Bookmark the permalink.